noun: tolerance1. the ability or willingness to tolerate something, in particular the existence of opinions or behavior that one does not necessarily agree with. The quest for acceptance by the LGBT community has gone from the sublime to the ridiculous. 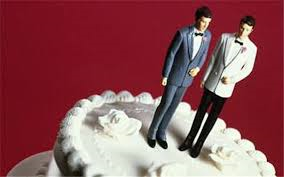 Men and women of faith who own businesses and refuse to celebrate the nuptials recently legalized in many states of the LGBT community are being martyrized by the government because of their lack of tolerance. A recent lawsuit filed in Oregon could cost one business $150,000 for trying to uphold their beliefs. In a blog I wrote in December 2013 called “Did Hate Come Down On Christmas Day?” I made a case in favor of the LGBT community and the fact that according to the Bible Christian believers should do business with those whose morals do not align with theirs because “none is without sin”-even the most fervent believer in the Bible. This tolerance is now being used as a battering ram by the government in case after case of punishment and fining and driving into bankruptcy those who refuse to tolerate something that is morally objectionable to them. There is even a case where a business owner was threatened with jail time for refusing to perform gay weddings. It reminds me of a certain local individual in my area who has used the American Disabilities Act as an opportunity to financially benefit by suing nearly every business in town who doesn’t meet the regulations. The litigant made settlement after settlement while their attorney lined their pockets as well. Some of the businesses had to move their location because of pressure. These new tolerance laws are becoming the new witch hunt, but it is the “sinners” hunting the “righteous”. It seems to be a great set up for certain opportunists to “cash in”. Tolerance needs to be a two way street. With the drop in church attendance nationwide, it is hard to believe that those in the LGBT community will have a difficult time finding businesses who are willing to celebrate with them and share their joy in uniting in marriage. If true tolerance and harmony is the goal then there needs to be tolerance for those in the faith community as well. Those whose goal it is to receive tolerance must be willing to give tolerance. ← Why do corrupt governments document their own crimes?